Do you find that the summer heat takes a lot out of you? Shake things up by making fruit-based popsicles and slushies. They offer calories (as a snack), vitamins and minerals and the nutrient most essential for life (2nd only to oxygen)… water. Two essential kitchen accessories to ensure happy faces all summer include a high-powered blender and a set of popsicle molds. Make your own tasty, refreshing slushies and popsicles. There are many recipes available online. You can also make up your own recipes. Use what’s in season and think outside of the box. When it’s super-hot, you may not feel like eating. Irregular eating patterns can zap energy. For a fun pick-me-up, these treats can do the trick. A few ideas to get you started: in a blender, whip up equal parts nonfat yogurt and frozen raspberries (about 1 cup of each). Add sugar or another sweetener to taste. Blend well, pour into molds and freeze. Love avocados? This neutral-flavored, creamy fruit makes great (saturated fat-free) ‘ice cream’ and ‘ice’ pops. Start by combining a 1/2 cup sugar and 1 cup water in a pot. Place on the stove top (medium heat), stirring occasionally until the mixture boils and the sugar dissolves completely in the water. Let cool to room temperature. In the meantime, scoop the flesh out of two medium-sized ripe avocados and put in a blender. Add the cooled sugar-water mixture. Add 2 TB fresh lime juice. Optional ingredients include fresh mint leaves and/or a splash of tequila (adults only!). Blend well at high-speed. Pour into popsicle molds. Freeze and enjoy. Each recipe makes 5-6 large popsicles. Make yourself a hydrating, refreshing green slushy by combining, in a blender: 1 cup cucumber (peeled, seeded regular or ‘English’ cucumber), 2 cups honeydew melon chunks (that you’ve frozen), a dozen fresh mint leaves and 2 – 4 tbsp. 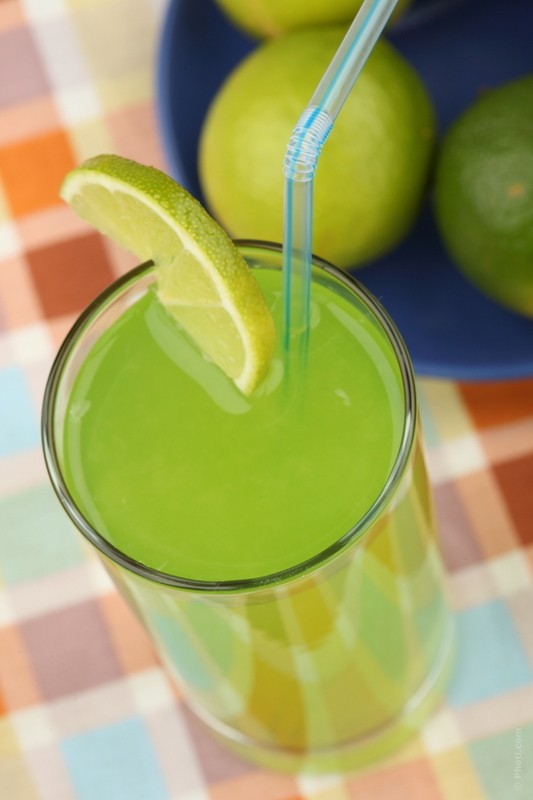 fresh lime juice (to taste) as well as 1 – 2 tsp. honey. Blend well and serve in 2 tall glasses. All three of the above recipes offer 100 to 200 calories per serving.